They are separating, and nobody knows what the hell is going to happen to the site. 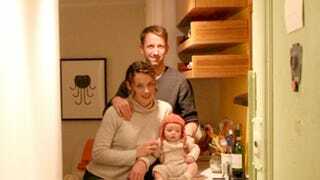 This despite the fact they've been very public in sharing their lives as a happy couple living in New York City in a small apartment, with a small child. Since they made a point of living, and documenting their time, in very small spaces, there will no doubt be a few "the marriage was built to last, but the house was built too small" jokes. But for regular readers of the site, this is actually a genuine bummer. They seemed to have made such a nice life for themselves and their daughter. A rep for the site wouldn't confirm the split and said only, "Apartment Therapy just consolidated and relaunched its sites to enhance the focus on home design and home cooking. . . . We ask that you respect our family's privacy." There's been a lot of romantic upheaval in the blogosphere of late—it was just in January that we heard the news that super mommy blogger Heather Armstrong and her husband were calling it quits.